This Wednesday, while Streetsblog reporter Noah Kazis was wrapping up his piece on the propriety of devoting pro bono legal services to help wealthy Brooklyn residents eradicate a bike lane, we received a letter from Gibson Dunn attorney Jim Walden. We think the letter is illustrative of the tactics employed by opponents of the Prospect Park West redesign. The letter is dated February 18, two days after Noah started submitting inquiries to Gibson Dunn about how the firm decided to work pro bono for Prospect Park West bike lane opponents. 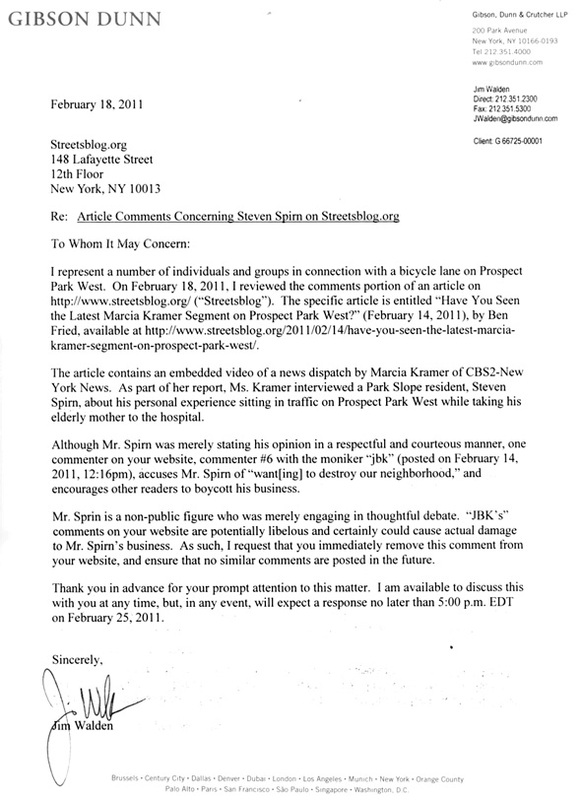 In the letter, Walden contends that a reader comment left in response to a February 14 Streetsblog post is “potentially libelous” in its treatment of Steven Spirn, a member of the anti-bike lane group Neighbors for Better Bike Lanes who appeared in a Marcia Kramer CBS2 news segment embedded in the post. I called Walden yesterday and told him that Streetsblog will not be removing the comment in question because it does not violate our comment policy and does not constitute libel. I asked if he intended to pursue legal action. “I’m going to evaluate that with my client and I’ll let you know,” he said. I asked Walden if his client in this case is “Neighbors for Better Bike Lanes,” and he said no, in this case, he’s representing Spirn individually. He then refused to answer any questions about his representation of Neighbors for Better Bike Lanes. Update: At the request of the commenter, the comment in question has been removed. Here is Walden’s letter to Streetsblog (you can click to enlarge). CXL-The 2013 summer came again, if you have love to choose a pair of christian louboutin shoes right now? christian louboutin pumps will make you a shine at the moment.Don’t do the most brilliant and also don’t do the lowest. christian louboutin sandals with its own language, confided women the curve of the gentle, sending out the mature female charm.christian louboutin sale shoes is popular all over the world. The issues presented are the most important of your life. The sense of loss over the end of the marriage and the unknown consequences that it brings can be overwhelming. You may be asking, how will my children be impacted; what will happen to my time with my children; what will happen to my home, my retirement, my business; how will I make ends meet. LaFrance Law provides individual and compassionate guidance and counsel to assist people who are faced with one of the most difficult experiences of their lives. Our firm provides a level of service to every client, whether it’s a divorce, paternity, custody or modification of a prior order as if you were a family member. You will receive prompt responses to your calls or emails and sound and honest advice.